Coconut shrimp is more of a Caribbean dish then Thai. However, it is popular in many Asian cuisines as well. You can give the coconut shrimp recipe some Thai twist by adding some sesame oil in the batter and serving it with a little spicy Thai-flavored dipping sauce. For this particular recipe, you can also butterfly the shrimp before breading it with the coconut shavings. If you are planning to freeze some of the coconut shrimp for future use, I recommend butterflying it. Ingredients: 1 lb. black tiger shrimp (size 16-20, peeled and deveined tail-on shrimp), 2 eggs, 1/2 cup milk, 2 Tbsp. Pina Colada mix, 1/2 tsp. sesame oil, 3 Tbsp. all-purpose flour, 1 tsp. onion powder, 1 tsp. salt, 1/2 tsp. white pepper, 1 cup panko breadcrumbs, 1 cup shredded coconut, vegetable oil for deep-frying. Recipe: Combine the eggs, milk, Pina Colada mix, sesame oil, flour, onion powder, salt and pepper and mix them into thick batter. Dust the shrimp lightly in little flour and dip them in the batter holding them by the tail. Combine the shredded coconut and panko breadcrumbs in a bowl and after dipping the shrimp in the batter, coat them with the coconut breading leaving the tail uncovered. Preheat a deep-fryer to 160 F and fry the coconut shrimp until golden and crispy. Remove the coconut shrimp from the oil and place them on tissue paper for a few minutes to remove the excess oil. Serve the coconut shrimp with your preferred dipping sauce. 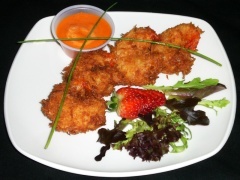 Cooking Tip: The coconut shrimp can be prepared well in advance and kept frozen until needed. If you are going to freeze the coconut shrimp, arrange them on a tray with some space in-between so they don't stick together. Deep-fry the coconut shrimp from frozen on order. It will take approximately 4 minutes.